John Newland Maffitt (1819-1886) was one of the best-known of all Confederate naval officers. 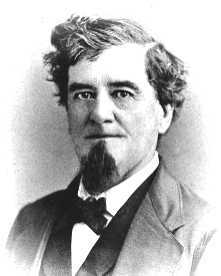 In 1861, after serving nearly 30 years in the U.S. Navy, Maffitt resigned his commission and entered Confederate service. Maffitt is best known for his command of the commerce raider Florida, which in a single cruise destroyed or captured 47 U.S. merchantmen, but he also commanded the ironclad ram Albemarle and ended the war commanding blockade runners. Maffitt was an aggressive officer. A reporter for the New York Herald who encountered Maffitt in neutral Havana wrote, "Captain Maffitt is no ordinary character. He is vigorous, energetic, bold, quick and dashing, and the sooner he is caught and hung the better it will be." Maffitt was particularly suited to blockade running, having spent half his Navy career surveying the U.S. coastline and preparing detailed hydrographic charts. In the closing months of the war, Maffitt commanded the government-owned blockade runner Owl, a 446-ton steel-hulled paddle steamer built at Liverpool in 1864. Owl was a large ship, though, which was a liability in shallow Texas coastal waters. During her one run into Galveston, Maffitt's ship very nearly suffered the same fate as Denbigh would just a few weeks later, and in the same spot -- on Bird Key. The following article, from the Galveston Tri-Weekly News of April 19, 1865, tells the story. One of the assisting vessels, the Laird-built steamer Lark, would soon become the last blockade runner to clear a Confederate port. Ed. News: -- We regret to have to be under the necessity of condemning the press for any one thing, and are well aware that they have much to attend to from day to day, for the interest of their readers and the benefit of the Confederacy, but cannot imagine how the people of Galveston should ever have entertained the idea of allowing our Confederate friend, Capt. Maffitt, to be passed unnoticed. We are well aware of his previous history, connected with the U.S. Navy, where he has shown himself worthy of the recommendation of the Secretary of the Navy, and are, also, well aware that when hostilities between the United States and the Confederate States commenced, that he was among the first of the Navy to volunteer his aid and services for the freedom of that new and young Confederacy. His efforts have been untiring, and his usefulness, while in command of the C.S. Steamer Florida, in destroying the commerce owned by our enemies, is too well known to be repeated by us. All we will say, is that he was among the first to participate in the destruction of the commerce of the United States, which effect has been equal to battles won; and none can say that his career since, up to the present hour, has not been wholly devoted to the cause. How like a sailor and a man, did he stand by his ship, the Owl, when, in the hour of peril, within reach of Yankee guns, and had they known his situation, could have captured ship and crew. A few of us, at the earliest possible moment, visited his ship, for the purpose of rendering assistance; and, among the number, was Capt. McGarvin, with his steamer, the Diana, whose timely assistance, together with the whole-souled Capt. George Blakely, of the steamer Lark, rendered timely and efficient aid. Upon arriving alongside, all were anxiously looking to see Capt. Maffitt, who was standing in the gangway of his ship to receive us, but none could recognize him, as we expected to find him fixed up with gold lace &c., but it was not so. He looked more like a cool, unconcerned passenger than a Captain in the C.S. Navy, with a Scotch cap, a torn coat, and a pair of rubber shoes, without socks. This was the condition in which we found him, but any sailor knows full well how to meet another. He was glad to meet us. His vessel had been in imminent danger for a long time. His previous reputation was at stake. His hard work, together with sleepless nights, and kind and encouraging words to to his men were, with the assistance of a few others, crowned with success, and the good ship Owl, with her gallant Captain and crew, are now safely anchored in our beautiful Bay  the first C.S. ship that ever visited our waters. . . . The crew are good, as we call ourselves good judges, and witnessed their hard labor in the hour of trial, and their great regard for their commander. The ship cant be beat, as is as fine a craft as ever floated, and if Yankee gunboats ever get after her, she will show them a light pair of heels, and the officers will cry, "come on, old Abe!" 2001 Field Crew | In-Kind Contributions | How Much Coal? Institute of Nautical Archaeology, Texas A&M University, E-mail: (barnold@tamu.edu). Sunday, July 15, 2001 Revision. Questions, comments or suggestions about this website? Send them here.